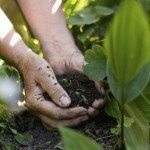 Should I use already used soil mixed with manure or compost for transplanting? This, largely, depends on the type of plant and if the soil in question already has a high nutrient content. If the soil is light, then I see no problem in giving it some extra help. If it is a strong mix to begin with, then you will have trouble starting seedlings, as the mix will be too "hot" to plant young plants into. So, use caution on which kinds of plants you put into a heavy mixture. Many houseplants will not tolerate this much nutrient content, and will quickly burn. A vegetable, once well established, will thrive quite happily in such a mix.